especially if you’re looking for more than a monthly pay check!!! So, I’m going to give you 3 questions that you must be able to answer … at least for yourself… if you’re looking for more than a monthly pay check! Or, if you have no idea what and where the hell you want to spend the next few years. Then, these 3 questions, that are damn simple and right to the point, will help you see clearer. And the answers to these 3 questions will bring clarity and directions. Can you do this job very well? Seriously, can you be really good at it? Why would you be very good at this job? Is it a matter of knowledge, skills, experiences or something else? So, what’s this something else? What made you answer “maybe”? Can you do the job very well on the long term? Because we all know that we can force ourselves to do a job very well for a certain period of time, maybe 2 hours, 2 weeks or 3 months. Because, we have to convince, to seduce. Because we know we are watched by the employer, the buyer. 3) in a way that is not really natural to you. Then, the performance is going to decrease quickly. And with no doubt your satisfaction with it, and quite probably your level of self-esteem. The enthusiasm of the beginning, and the energy that goes with, will quickly fade away. In most cases, it’s not a matter of intelligence! Are you looking to express your own unicity and creativity? Are you looking to get power? To do what with this power? Do you enjoy to multiply the potential of anything you’re dealing with by 2, 3 or 4 …? You need to know what you are driven by. Seriously, no joke! I could leave you here with these 3 questions, and … GOOD LUCK! But I’m going to give you an extra-help! I told you those questions are not complicated to understand, no tricks! But they strike right to the point! So that’s not the questions that are complicated. It’s the freaking answers! – what your deep drivers, your deep motivations are. In my experience, when facing with these questions, most people are unable to answer. And most people won’t even try to find the answers. Either, they run away, they elude, they invent or vomit the same “I’m a hard worker”, “good team player”, “I’m a good leader”. Well… They make up something, because somehow they know they have to say something. But, if you’re looking for more than a monthly pay check, THEN don’t run away, don’t elude, don’t invent and don’t vomit. To tell you the truth, we’re not used to think in these terms. And we lack practical and clear data about ourselves. Even for the most introspective ones of us, it’s far from being obvious. Moreover, studies have shown that we (more than 95% of people) are not perfectly aware about ourselves and more important, we have perception biases about ourselves! This last point is extremely important. Because, the consequences are very real. On one hand, that’s what leads us to “I thought I could do it, but … no!” situations and other “I thought I could bear it, but… I can’t stand it no more” situations. – to make, to try something completely different or in a different way. To find the answers to these questions, you don’t need to meditate in a cave for 3 years, neither ask God for illumination, or do a serious vegan diet, or ask all your friends and colleagues what they think about you. Nope! and accurate way to get all the answers! And, what if I tell you can get all the answers in 30 to 45 minutes? When you’ll get all your personal answers, you’ll be in the “less than 5% of the people on Earth” that have a really superior level of self-awareness. 1) Can I do this job very well? 2) Can I do this job very well on the long term? 3) What am I driven by? – to convince the recruiter you’re the right fit for the job. 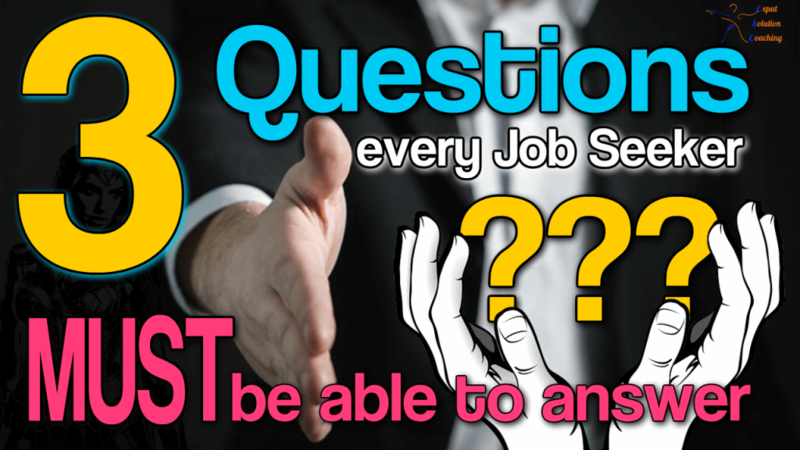 Said in another way, those answers will make way easier your abilities to SELL YOURSELF either during a job interview, a job tasks/responsibilities evolution, or even a career change. Because whoever you want to convince … a recruiter to hire you, or to convince yourself / your family /your HR manager of your next career evolution, your job responsibilities evolution, they will either believe you/ support you … OR NOT! It’s that simple. But, they will hire/support you only if, in their head, they BUY what you’re trying to SELL. Earlier I told you I’m going to give you an extra-help. and it’s not for everyone! As we are talking about your way to earn your life, to manage your career, and your job satisfaction, it cannot be free. There will be a price.